I’ve developed an obsession with my two dogs, Kylie and Kaycie. 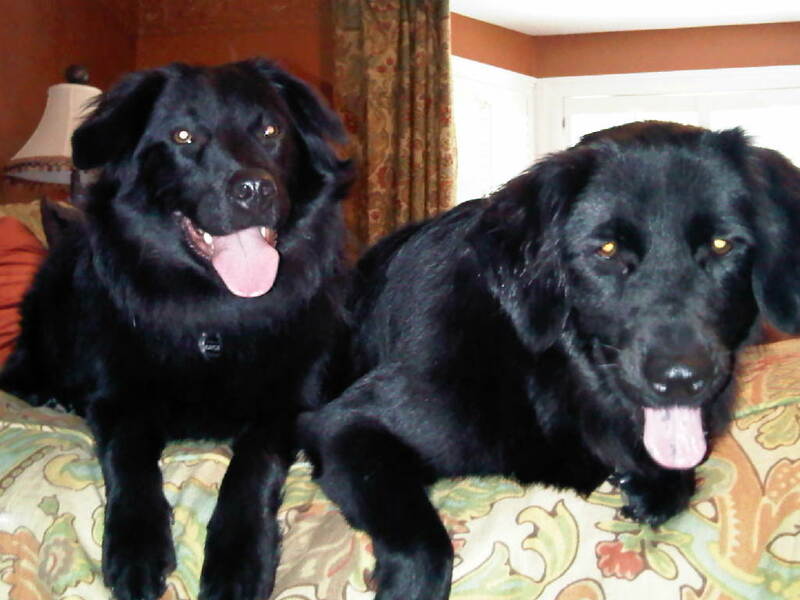 They are rescue dogs; black flat-coat-retriever mixes, 3 and 2 years old respectively, that we adopted from various shelters. As my daughter says, in this regard (and twice before) we’ve done mitzvahs — good deeds — by saving these poor innocent lives. To me, the dogs are almost like surrogate children. I love everything about them, from the way they act starved for attention (which they aren’t) to the way they constantly follow me around the house. Why this zaniness? Although we had two other dogs during the past 18 years (Sam and Lexi, z”l), I’m in a different place now; a place where I pay more attention to things. My kids are grown and, as a fairly new empty nester, I still have a need to nurture. And, since I’ve been home alone recently, with my husband’s frequent business travel, the “girls” and I have become inseparable. An important Jewish value, gemilut chasadim – acts of lovingkindness, epitomizes what adopting a pet and caring for it are all about. Clean Your Plate: Eat healthy and in appropriate portions; don’t let any food go to waste and enjoy what you eat. Take Naps: You should play hard, but need to rest too. Get plenty of sleep to rejuvenate and reenergize. Afternoon “power naps” work wonders. Sniff It Out: Do your research and proceed cautiously before diving into any new situation. Explore, but if something smells dangerous, stay away from it! See Your Partner With Fresh Eyes: Greet your partner and guests with genuine happiness and enthusiasm every time they walk into the room. Everyone wants to feel missed and special, the center of your universe. Find Something You Love and Do it Over and Over: Practice makes perfect. Find your passion and stick with it! Breathe Deeply: Even the practice of yoga teaches the importance of breathing deeply to center yourself and clear your mind. Relax. Speak Up When Things Don’t Feel Right: Listen to your instincts and clearly communicate your feelings and needs to others. Don’t be a doormat. Learn to Receive: Be a little selfish. It’s fine to take care of others, but you have to take care of YOU too! Know Who You Are: Be your authentic self! Know who you are and what makes you tick. Take Lots of Walks: Get out there, explore, and move! Drink Your Water: Stay hydrated. It’s great for your skin and necessary for your body. Don’t Be Afraid to Get Dirty – Jump In! : You’re never too old to play. Get out there, try something new, and have fun! Shake It Off: If you “get wet,” just shake it off. Don’t hide out to avoid conflict. Learn to let things roll off your back. Good Looks Will Get You Anywhere: Be cute, flirty, and playful. Stay well-groomed! Don’t Hold Grudges: Life is too short. Don’t hold grudges. Deal with your hurts, go sulk a bit, but then be the first to move on! I think these are wonderful tips to be mindful of or to try. They are good resolutions to make and important lessons to live by. Clearly, the relationship — the love, sharing, and learning — between people and their pets can be mutually beneficial. I feel justified in my obsession for my two! If you have a pet, try to learn something new from its behaviors; if you don’t have one, I recommend that you get one…or two!